There is a potential for some wonderful antioxidants, under certain conditions,to become pro-oxidants and actually have a negative effect by causingoxidation in the body. Some of the better-known carotenoid antioxidants that can become pro-oxidants are beta carotene, lycopene and zeaxanthin (Martin, et al, 1999). Even such familiar antioxidants as Vitamin C, Vitamin E and zinc can become pro-oxidants. This is another important factor separating Astaxanthin from other antioxidantsñit never becomes a pro-oxidant (Beutner, et al, 2000). 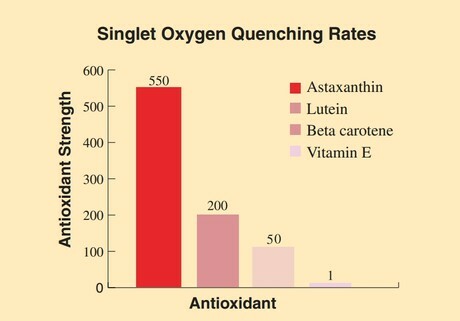 This is one more reason that Astaxanthin is clearly a superior antioxidant to others. A famous study of beta carotene on smokers was done in Finland in the 1990s. In this study, it was found that smokers who took synthetic beta carotene supplements actually had a higher incidence of cancer than those taking a placebo. Of course, this synthetic beta carotene is also made from petrochemicals like Synthetic Astaxanthin. It cant be expected to perform as well as natural beta caroteneñthe 'real deal' which is found in abundance in carrots and Spirulina. Because of Natural Astaxanthins unique molecular structure, it can span the cell membrane and have one end of the molecule in the fat soluble part of the cell, while the other end of the molecule rests in the water soluble part of the cell. You can see how a water soluble antioxidant like Vitamin C rests on the top, water-loving polar layer of the cell. It cannot protect the entire cell. And you can also see that a fat soluble antioxidant like beta carotene lies in the center, oil-loving lipid layers of the cell. It cannot protect the entire cell either. But Natural Astaxanthin has this unique ability to span the cell membrane; unlike other antioxidants, it can protect the whole cell at once.